Oct. 24, 2017 - Henco Viljoen, co-owner of Timbersoft in South Africa, is passionate about timber drying. He inherited this passion from his father, mentor, and co-partner, Johan Viljoen. Together they have developed customized drying systems for fine tuning, improving, and upgrading kilns. The result? Their client sawmills in South Africa are now generating greater productivity, higher quality products, and increased profits. “Our main business is optimizing the drying process,” says the younger Viljoen, who works from Sedgefield in the Garden Route section of the Western Cape. When Johan retired from milling in 2005, he decided to use his hands-on approach in helping other mills to improve their kiln drying. But he quickly discovered a problem – mills were now very technology driven, using computers, PLC and SCADA interfaces. He soon realized that processes happen behind the scenes in software code that he had no control over. This is where Henco got involved. With his IT knowledge, the Viljoens installed their first PLC/SCADA based kiln controller in late 2005. Installations and upgrades followed at regular intervals. The client base grew, and by 2013 Henco joined Timbersoft on a full-time basis after a career in IT and automation. In 2013, Henco started a small research project where he combined solar and heat pump technologies with their PLC and SCADA system to dry hardwoods “smokeless without a boiler.” The kiln dried Eucalyptus boards, which normally dry in four weeks, dried in less than two weeks. This technology opened up many more advancements, including the development of smoke/boiler free drying and ISPM15 heat treatment systems. “It also allowed me to make an in-depth study of the drying process, dynamics, and controls, enabling me to really improve our drying system by leaps and bounds. We used Johan’s vent cycle approach and developed a dynamic, self-adjusting schedule. “Although not yet 100% foolproof, we are very close. The system keeps improving. The goal is to leave the operator with only a start button…the program does the rest and stops at target moisture content (MC%). The operator won’t have to make any decisions,” Viljoen remarks. Since Henco joined the company full time, the business has grown by more than 300 percent and is still growing. Kilns running their system are currently drying about 300,000 cubic meters annually and are expected to increase to 400,000 cubic meters by the end of 2017. Moisture measurement is an integral link in the drying management chain -- and forms part of Timbersoft’s Process control. For that very important reason, Timbersoft relies upon moisture measurement. Viljoen says a moisture meter in the hands of a kiln operator is like a calculator or Excel spreadsheet in the hands of an accountant. Neither can go without it. Viljoen personally uses a Wagner L606 handheld meter to measure moisture in the kilns because of its speed, accuracy, dependability, consistency, and ease of use. Many of his clients use Wagner’s MMC220, L612 and L622 models, and the L722 stack probe for exactly these reasons. 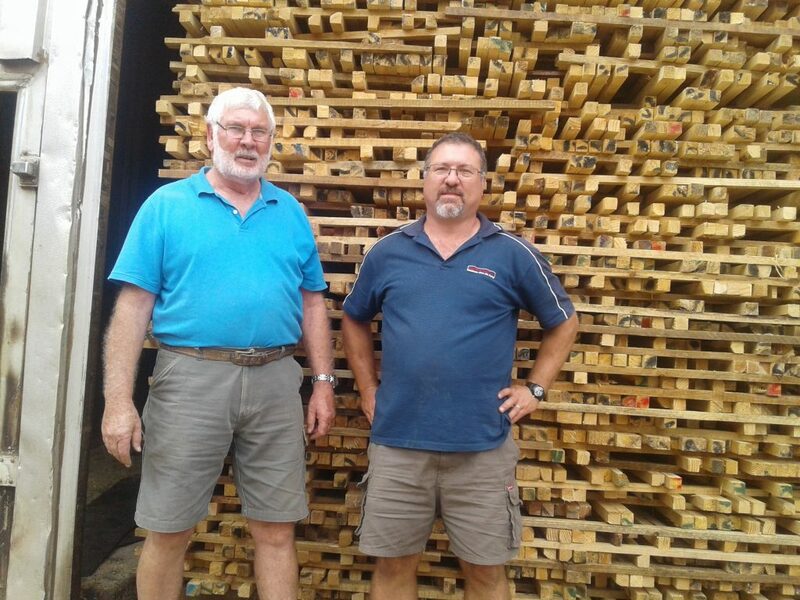 “The Wagner brand is very big in South Africa sawmilling with good reason. If you think capacitance moisture meter, Wagner is the first name that comes to mind. Even in student literature used by Nelson Mandela Metropolitan University’s Wood Technology course, the Wagner is used as an example of a capacitance meter,” Viljoen says. “You don’t hear of a Wagner meter that just stopped working,” he adds. While in-kiln moisture meters are important in achieving excellent results, Viljoen believes that MC alone should not be used as the only guide to where the schedule should be. However, for stopping at a desired final MC, it cannot be beaten. “The way the moisture evaporation rate in the timber reacts to a set point should be taken into consideration. This can be seen by observing how your vents react to a set point, but only when preparation, process control, and maintenance remain constant. “If you have the in-kiln moisture measuring facility AND you know how to interpret all the information your kiln controller is giving you, then you are on the road to becoming the best kiln operator a boss could ask for,” Viljoen declares. Because the Viljoen team is highly knowledgeable about using technology to dry timber, Timbersoft has achieved exceptional success. However, he cautions that operators who do not know how to interpret the information provided by high-tech systems can block improvements. “A kiln operator should be more skilled than just able to see the dry bulb is running low (call the boiler room), or the wet bulb is running high (fix water issue/check probe), or the in-kiln target MC% is reached (pull the timber),” he declares. The new high-tech systems have made kiln drying more graphic, and for a good operator with a clear understanding of these systems, it should be considerably easier. But for operators who lack this understanding, Viljoen says the ease of changing multiple variables can and has been catastrophic. “Kiln operators who use high-tech systems should never make more changes to a schedule than what they can accurately identify the outcome of,” he remarks. “Make a study of your kiln controller. Don’t just accept everything it presents you with. Try to figure out the logic it’s applying. More often than not, the programmer has no idea what kiln drying is about. The same applies to the kiln expert – he/she often has very little idea what programming is about. The operator needs to ask questions because the more he knows and understands, the more he’ll realize how little he knew when he started,” he adds. Viljoen says there are five points of drying management. If one of the first three changes, then the schedule optimization is affected. The first three points include preparation, process control, and maintenance. Preparation involves sawing accuracy, board dimension, and stacking procedures. Process Control involves airflow, energy distribution and management, humidity control, and venting. While maintenance involves electrical, mechanical, instrumentation, and structure. “When any of those three changes, it affects the dynamics of the kiln. This affects the rate at which moisture leaves the timber – meaning that the MC is not yet where it’s supposed to be at that stage in drying. “A MC-based schedule is more forgiving, as it is supposed to only progress to the next stage of drying when a certain MC is reached. A standard time-based schedule, however, won’t know what to do. This is why it’s of utmost importance that a kiln operator spots these abnormalities on the process graph and have the authority to stop the kiln and have it fixed,” Viljoen says. Quality control is essential for production yield and profitability. And one of the key factors in a good quality control program is moisture management. Inaccurate readings can lead to delays, low yields, and poor grade inspections. That’s why Timbersoft considers kiln moisture monitoring, using the Wagner moisture meters, to be part of their overall success. Timbersoft has many successful client case studies as proof of its customized approach to kiln moisture management. Learn more at www.tskilns.co.za. And, learn more about Wagner’s wood moisture measurement solutions at https://www.wagnermeters.com. Tony Morgan is a senior technician for Wagner Meters, where he serves on a team for product testing, development, and also customer service and training for moisture measurement products. Along with 19 years field experience for a number of electronics companies, Tony holds a B.A. in Management and his AAS in Electronics Technology. Call Wagner Meters today at (800) 634-9961 and ask for Tony, or visit www.wagnermeters.com.